That’s the feeling you get when you choose Eternity Windows from Ace Home Improvements. Your new windows will not only reflect and enhance your home’s beauty, they’re also built to last. Vinyl frames and sashes will never chip, peel, crack or warp. Made tough and solid with PVC resin, with color formulated throughout so the beautiful luster lasts. Triple-glazed insulated glass unit with optimal air space improves year-round performance. air infiltration, providing security, comfort and well being. Foam-filled mainframe for added insulation efficiency. An R-Value is a measure of the resistance of a glazing material or fenestration product to heat conduction. It is the inverse of a U-Factor (R=1/U) and is expressed in terms of hr-sq ft-F/Btu. A higher R-Value shows a greater resistance to heat flow and a higher insulating value than that of a low R-Value. Usually, window R-Values range from 0.9 to 3.0, except in special cases. 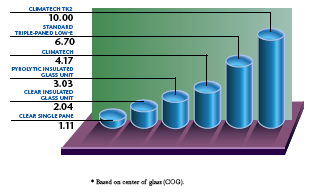 This chart shows that an Eternity Window with the ClimaTech TK2 insulated glass package is 80% more energy efficient than a standard double-paned unit. The Industry’s Most Advanced Spacer. Most windows today are constructed with a metal spacer between the panes to give the glazing unit structural stability. These metal edges conduct cold from the outside of your home at a rate up to 120% higher than at the center of the glass area. 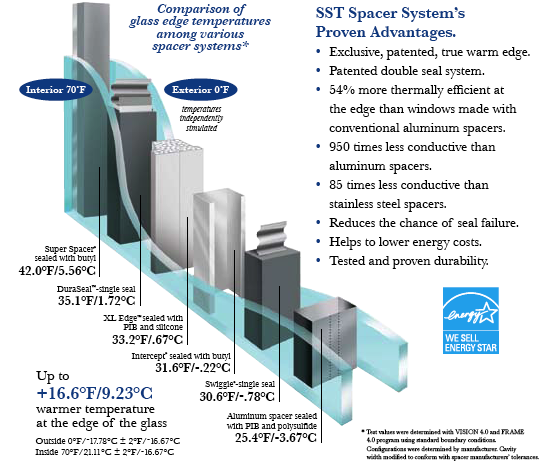 By combining a patented structural foam spacer with a seal of hot metal butyl to create a “warm” non-conductive edge, the non-metal SST spacer system eliminates metal to glass contact, increasing glass edge temperatures by as much as 16.6°F—up to 54% more efficient than ordinary insulated glass windows. SST’s warm edge design also helps to minimize the subtle movement of glass panes caused by changes in temperature, thereby helping to prevent seal failure and reducing stress on glass panes. It’s A Window Package You’ ll Want To Own. At Ace Home Improvement, we strive to provide homeowners with products that incorporate the latest trends and innovations available in the industry. 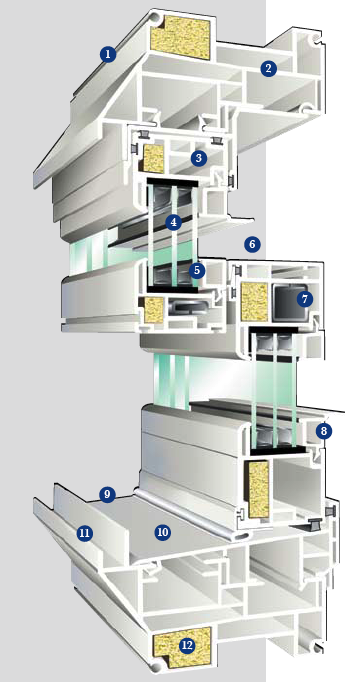 Our ClimaTech Plus Insulated Glass Package combines the finest spacer system with the latest in glazing technology. The result: superior energy efficiency without the hassle of messy condensation. 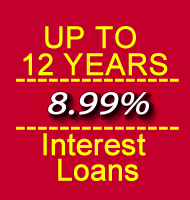 What a great way to maximize your investment through lower utility bills and added value at resale.